NICHOLSON, Alfred Osborn Pope, a Senator from Tennessee; born near Franklin, Williamson County, Tenn., August 31, 1808; attended the rural schools; graduated from the University of North Carolina at Chapel Hill in 1827; studied law; admitted to the bar in 1831 and commenced practice in Columbia, Tenn.; edited the Western Mercury in Columbia 1832-1835; member, State house of representatives 1833-1839; appointed as a Democrat to the United States Senate to fill the vacancy caused by the death of Felix Grundy and served from December 25, 1840, to February 7, 1842; member, State senate 1843-1845; moved to Nashville, Tenn., and edited the Nashville Union 1844-1846; a director and subsequently president of the Bank of Tennessee in 1846 and 1847; declined an appointment to the Cabinet of President Franklin Pierce in 1853; edited the Washington Union 1853-1856; public printer of the United States House of Representatives; again elected to the United States Senate and served from March 4, 1859, until March 3, 1861, when he withdrew; expelled from the Senate on July 11, 1861, for support of the rebellion; chairman, Committee on Revolutionary Claims (Thirty-sixth Congress); chief justice of the supreme court of Tennessee 1870-1876; died in Columbia, Maury County, Tenn., March 23, 1876; interment in Rose Hill Cemetery. Dictionary of American Biography; McKellar, Kenneth. 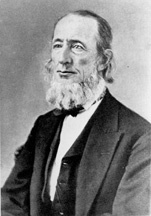 Alfred Osborne Pope Nicholson, in Tennessee Senators as Seen by One of Their Successors. Kingsport, Tenn.: Southern Publishers, Inc., 1942, 212-221; Caruthers, Robert Looney, and Alfred Osborn Pope Nicholson, comps. A Compilation of the Statutes of Tennessee, of a General and Permanent Nature, from the Commencement of the Government to the Present Time. Nashville: J. Smith, 1836.